If one is to be a true martial artist, one must train their body accordingly to their art. By conditioning, the body becomes stronger and more resistant, making conditioning an essential part of any self defense discipline. When conditioning we must see all the reasons for which we want to condition. If one is to be a true martial artist, one must train their body accordingly to their art. By conditioning, the body becomes stronger and more resistant, making conditioning an essential part of any self defense discipline. When conditioning, we must see all the reasons for which we want to condition. In other words, if you want to train a specific area of the body, you have to know why and for what reasons. How do we get from where we are now, to where we want to be? We need a plan. Only then can we can know what type of conditioning training is needed. So why condition the wrists? Usually, many people will wrap their wrists with cloth, tape, or a support to protect them from being injured. This method makes sense if you are training for fun, or if you are punching the bag for good cardio workout. However, if training for the purpose of self defense, you must train accordingly. If ever we find ourselves part of an unavoidable fight situation, it is unwise to tell the opponent to wait because you got to wrap your wrists first or you'll injure them. In such circumstances, we have to be ready for anything. The wrists are very complex. They are like the neck of the hands. Wrists can bend and twist in many different angles, allowing your hands much versatility in movement and ability. Your wrists are amongst the many important joints that absolutely must endure to survive in battle. Anything that you hold or support with your hands, including weapons and equipment, must be properly supported by the wrists. Our hands are also our primary tools of attack, defense, and control. If your wrists become fatigued or injured, then it will significantly decrease your ability and chances to survive in battle. 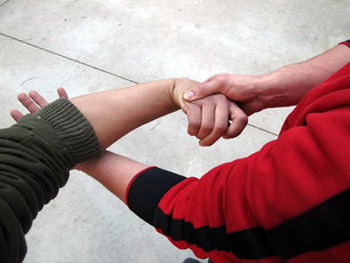 If your specialization is Chinese Kung Fu, then there are many reasons to train the wrists. If your wrists get tired, even the most flawlessly executed techniques could become of little use to you. The beautiful movements associated with Chinese Kung Fu are worthless if your wrists are unable to handle the stress required to perform them. You should get to know the wrist, learn how it works, and understand what each part of the wrist is responsible for. Bones: Our bones are what give us our body's frame. Bones are made up of a piezoelectric type of material, which is a type of material that can generate energy as a response to pressure or strain. Bones have to be strong and solid. They should be able to withstand impact, and the stress related to the practice of each martial system. In order to train the bones of the wrist we must properly align them when striking something hard. Otherwise, you will risk injury to ligaments, tendons, and muscles. Tendons: Tendons are a band of elastic, tough fibrous tissue that connect muscles with their corresponding bones. They should be strong enough to support the stress that is created by a powerful muscle contraction. Tendons are similar to a spring in structure since they stretch and contract in a similar way. They are also composed of piezoelectric material. Ligaments: Ligaments are bands of tissue, usually white and fibrous, that are responsible for connecting bones to one another. Ligaments are not as elastic as tendons. Because they are less flexible, ligaments are more susceptible to injury. Wrist ligaments should be strong and flexible enough to support the hand when striking a hard object. 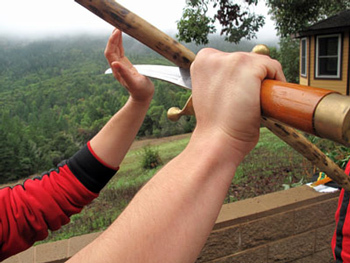 This is also important when holding and swinging a weapon for a long period of time, or when resisting the stress caused by a vicious Chin Na technique. Muscles: Muscles are composed of groups of cells that can contract and expand to increase and reduce tension, producing movement. We have three different kinds. Slow twitch (red), medium twitch (pink), and fast twitch (white). The amount of each fiber present in the body can differ from one person to another. It is dependent on the individual's training routines and daily life activities. Training the muscles of the wrist require us to train the forearm muscles. These are the ones that we flex to control the wrist and the fingers of the hand. Each type of muscle fiber has unique characteristics. (RED) The slow twitch muscle fibers are the slowest and the weakest. They have the best endurance and can contract the longest. As long as you have adrenaline or glucose to stimulate the muscle fibers, they will contract. (PINK) Medium twitch muscle fibers are not the weakest nor are they the strongest. They will contract faster and stronger than slow twitch, but not as fast or as strong as fast twitch fibers. In a normal individual, these muscle fibers will last for around twenty minutes of contraction before they become exhausted. These muscle fibers bring a balance, and help the other two kinds by providing the extra "push". Kind of like how when swinging on a swing you only need that little push from someone at the right moment to make you go faster(fast twitch), or to continue the swinging motion longer(slow twitch). (WHITE) Fast twitch muscle fibers are the strongest as well as the quickest. This is the muscle tissue that gives us that fast and powerful burst of strength. Since fast twitch muscles are the strongest amongst the muscle fibers, they require more fuel. Because they use so much energy, they become fatigued faster. Generally speaking, on an "average" untrained person, after about 30 seconds of quick repeated contraction, these fast twitch fibers will begin running out of energy. From a martial aspect, when we condition our bodies, it is good to keep in mind how important these details can be. The better our conditioning, the longer we can continue functioning at optimal levels. Once we begin to understand the internal aspects of training, we can then combine them with external exercises. Doing so will increase the endurance of the area being trained, and in effect speed up the conditioning process, and improve the final result, amongst many others. External training is much easier to understand, because we can see the results. Bones, ligaments, tendons, and muscles should all be considered when creating or doing an exercise for conditioning. Luckily, in such a classical art as most styles of Chinese Kung Fu, many exercises have already been created and passed down through several generations to condition for a specific art. There are four areas for training the physical body: strength, speed, flexibility, and endurance. Some exercises benefit all four at the same time, such as rope climbing, specially if done at different angles. If you choose to focus on training specific areas, the following drills may be trained. Cinderblock flipping and catching is a great exercise to increase the strength of the wrist and its surrounding areas. Wrist conditioning can also be achieved with a staff. While holding one end of the staff with one hand, swing, stab, and make circular movements, simulating different combat applications. Holding the staff closer to one end of the staff increases the weight, strain, and conditioning on the wrist, allowing you can adjust the weight to your own level. This exercise will also stretch out the wrist and in addition strengthen muscles, tendons, and ligaments. You can also train correct wrist alignment and strength by doing fist/knuckle push-ups. This will cause stress to the many small bones of the wrist. In order to stabilize these bones, the ligaments and tendons are worked hard and ultimately conditioned. By training the tendons and ligaments, we also train the muscles surrounding them, and the bones which benefit from their piezoelectric properties. When training for speed, one drill you can practice is closing your hand into a fist and then opening all of your fingers again over and over as fast as you can in one simultaneous flow of movement. This should be initially practiced for about 30 seconds each hand. It is also important that you keep track of how many times you can grab in this fixed amount of time, so that you may compare and study your progress. Another speed exercise you can train is stick swinging. Swing a light stick or rod back and forth with full extensions, as fast as you can. The stick can be swung in four directions, each to be practiced for about 15 seconds. The four angles are vertical, horizontal, and the two diagonals. Flexibility is very important, especially for Chin Na training. You can enhance the flexibility of your wrists by stretching your wrists in several different angles. A similar effect can be achieved by extending your arm out when practicing staff swinging. Flexible wrists enable you to have less pain when Chin Na is applied to you, due to the increased range-of-motion in your joints. Endurance is always being trained, no matter what exercise you do. However, you can adjust each exercise to produce different results in your endurance training. For example, by doing more staff swinging reps with less weight, you will essentially focus more on endurance than on strength. All of the above-mentioned exercises should be practiced for at least 6 months to a year. This will bring the best results to your practice. A martial art is a tool of self discipline. When studying an art, we must practice diligently in order to achieve a deep level. This practice can eventually provide us with infinite knowledge and manifest to us a lifestyle of self-awareness. It is highly recommended that you find a good teacher to facilitate the learning process. If you possess no such luck in finding a teacher, you must strictly discipline yourself to train on your own. *It should be noted that all the repetitions amounts, and the time frames for the exercises given, were designed for beginners and can vary according to the level of each individual.